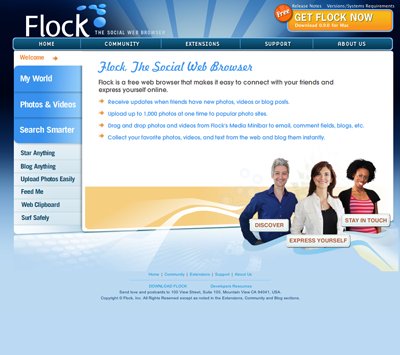 Sorry to hear you don’t like the new Flock.com. We love feedback on both the browser and the website, so if you have any specific qualms you’d like to see addressed, shoot them to my address below and we will take them into consideration as we continue to develop our website. Development is always a complicated process, and feedback from folks outside of the company is always super helpful. @Matthew: We’ve made significant strides in browser stability for Flock 0.9, and we are based off of the Firefox 2.0 architecture. I think you’ll find the experience much better than older versions, if you give it a try. Thanks to both of you for the honest feedback! 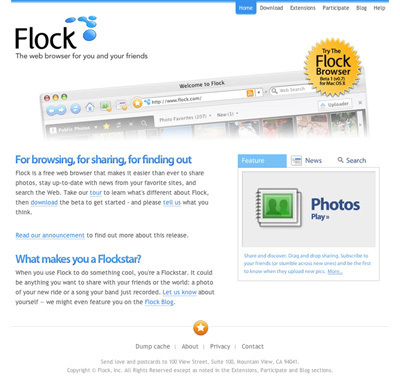 I can’t believe that Flock actually did this. Do you know any browser site that have flash in it? I truly loved the previous version. It looks like the result AOL sodomising istockphoto with a bad jpeg compressor. And I thought I was just crazy. I just couldn’t figure out why they thought they needed a new site. The old one was excellent. Why change it? If I were them, I would ask Bryan to just extend the old design. As far as the browser, I like the concept but it going to take a while to get it right. Each time I install it, I uninstall it about 10 minutes later. I do hope the project is successful. It just doesn’t seem to be for me. Wonderful write-up and good style, is this a normal theme?